We have developed our own simple-to-use, incredibly flexible software that gives you full control over every aspect of your simulation environment and lessons. We will provide you with all the software, hardware, training and support necessary so you can get on with creating your own fully interactive lessons, virtual field trips and exercises. Create your own lessons in minutes or choose from our curriculum based library. All from your tablet. Our template system allows you to easily edit and create new scenarios. Choose a template from dozens of pre-builds that are ready to use. Browse our selection of pre-built templates opposite. 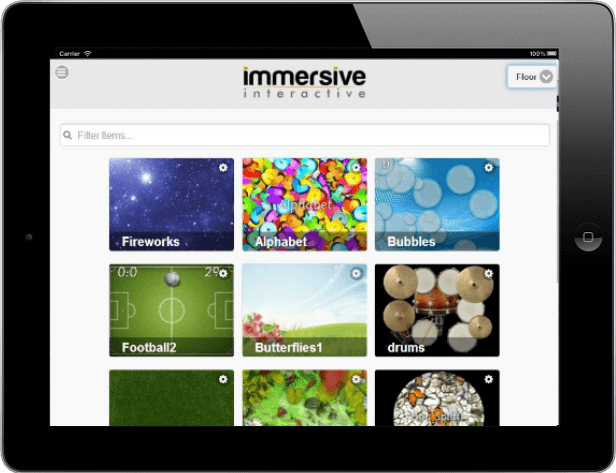 Add interactive elements to your lessons with a simple touch-screen interface. Our software comes with our special 'LITE LICENSE', which allows you to install our software onto multiple laptops so you can work on your interactive lessons any time, anywhere. Immersive Interactive will use our expertise to help you select, prepare and build your immersive classroom, whether that be a mobile, permanent install or space conversion. Whatever space or size, we have a solution to suit your needs.